The SFMTA plans to study safer walking and biking routes on five of the Richmond District’s north-south streets, which connect the Presidio and Golden Gate Park. At the behest of D1 Supervisor Eric Mar, the SF County Transportation Authority recently granted $100,000 in Prop K sales tax revenue for the SFMTA to launch the study. Over the next year, planners will conduct walking and biking tours, as well as community meetings, to survey conditions on Eighth, 15th, 23rd, and 34th Avenues, and Arguello Boulevard. While these streets are already relatively calm, planners could identify ways to make them more inviting and easier for everyone to bike on, including families with children. One difficult spot to traverse on bike is the link from 23rd, a designated bike route, into Golden Gate Park, which requires people on bikes to travel a block on high-speed Fulton Street and navigate onto a narrow sidewalk ramp toward a park path. The greatest danger on these routes seems to lie at the major cross-streets — Fulton and Geary Boulevard — which are notorious for dangerous driving. Today, a man was hit by a driver in a crosswalk at Geary and 26th Avenue. A Google Maps view of the Richmond’s bike routes. On February 23, a mother and her toddler were hit while bicycling by a driver who reportedly ran a red light at Geary and Seventh Avenue, a spot that isn’t on the list for study. Last April, three-year-old Nikita May was seriously injured on his bike in a crosswalk at Fulton and 43rd Avenue by a driver making a left turn. A month earlier, a 5-year-old boy and his babysitter were hospitalized after being struck by a driver at Fulton and 37th Avenue. Fulton isn’t set for traffic lane reductions or other measures that could seriously reduce speeding and injures, but its speed limit was recently lowered to 30 miles per hour, and received some transit bulb-outs west of 25th Avenue. The SFPD’s Richmond Station is the only one targeting traffic enforcement to the top five causes of traffic injuries. Geary’s six general traffic lanes are set to be trimmed to four, with sidewalk bulb-outs added, as part of the Geary Bus Rapid Transit project in 2017. Once the study is completed, an SFCTA document [PDF] says “the SFMTA will advance the top two corridors or sets of locations to detailed design,” with the other improvements to be implemented later. The Richmond’s streets have seen safety and traffic-calming improvements in recent years, including a traffic circle at 23rd and Anza Street in 2013, most of which were part of the SFMTA’s Central Richmond Traffic Calming Project. 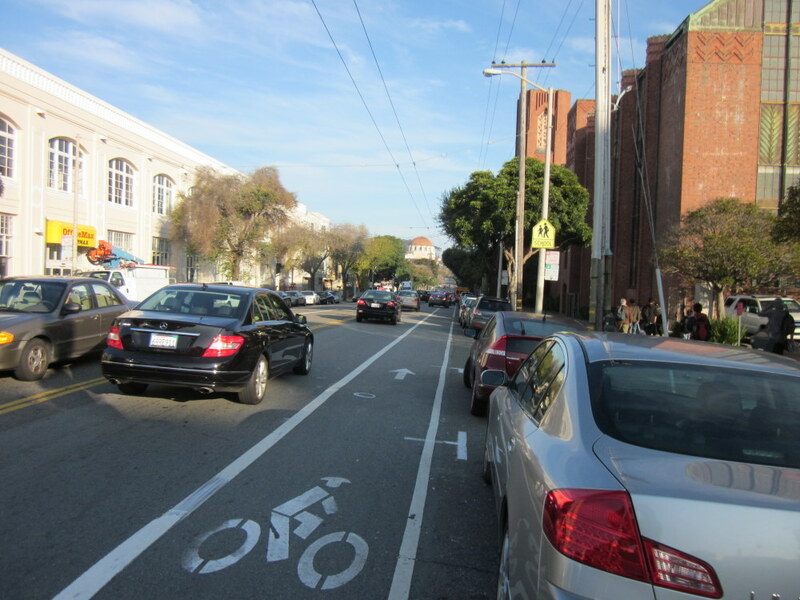 The Arguello bike lanes and road diet were also implemented over a decade ago. With the street set to be re-paved next year, the SF Bicycle Coalition has launched a campaign for it to receive an even better redesign. yes let’s try to understand how we can make things safer by continuing to throttle slogs of cars through these intersections. We can fix this with paint and maybe some bulbouts! Great news! I’m going to contact Sup. Mar’s office to see how I can be of assistance. Paint and bulbouts?! What do you think this is, Mr. Fancy Pants…Delft?! I think the Richmond District could learn from Richmond California, and just overengineer streets for cars like normal, even on stretches where lots of cars have never shown up but hey, better do it everywhere *just in case*. Rather than take even an inch away from phantom cars Richmond’s Solomon’s Solution is BIKE ROUTE signs along its sidewalks. But since it’s a sidewalk–this is a “bike” “route” for walking ONLY, scofflaws! $100K to “study safer walking and biking”? Great. We’ll study/analyze the area to death and recommend improvements to be implemented “when funding becomes available”–probably around 2019. At that point, no one will remember the study, and all the work will need to be re-done. Don’t do plans. Do projects. Instead of spending $100K on a study, the SFMTA should just ask the Mayor’s optometrist what should be done. Please put in either a four-way stop or a traffic circle at 34th and Anza. It’s not readily apparent to a bicyclist on 34th Ave. that traffic on Anza does not need to stop, and despite Anza being more or less empty, every now and then you’ll get someone in a car zooming down from Washington. 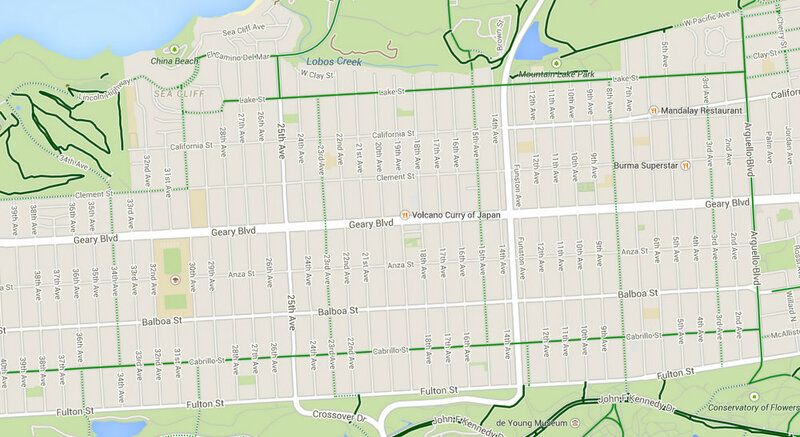 It also does not help that a bicyclist has a decent downhill (at least coming south from Geary). I’ll let your imagination fill in the rest of the scenario. These bikes were made for walkin’, and that’s just what they’ll do. Cause if those bikes don’t walk the law will walk all over you. A dum dum dum dum dum dum dum dum. The bike path connections coming from JFK along the garage exit at 10th and Fulton as well as the connection between the path exiting at the rose garden, then jogging right then left onto Funston should also be looked at as part of this study – both are ill defined and dangerous messes. As a resident of 8th Ave, this is the most awesome news I’ve heard in awhile! Please go big, SFMTA and Supe Mar. If you actually want to use the 23rd Ave route, it seems easier to me to turn onto Cabrillo (newly repaved and striped through this section) and climb 22nd Ave instead. That way you get a traffic light to help you cross, which is a nice bonus given how intimidating the traffic on Fulton can be. You will have to hit the crosswalk button, though. I usually just enter the park at 25th Ave, but that might be a poor risk assessment on my part. I wish the sand and debris would be removed regularly from the Crossover Drive shoulder, and really wish it and Transverse would be repaved. We love our bikes so much we take them for walks!